Torn World has a 3D render up (and a spinning view of it in the link) of their Sisk Light War Golem. Go check it out. The Sisk faction is known for their "Roman-like" expansionist nature, fueled through an army of war golems discovered in the heart of their empire several hundred years ago. Since discovering this ancient weapons stash, they have been nearly unstoppable in their conquests. Pictured is a Sisk Light Golem. It stands approximately 12' tall on the battlefield (60mm to the eyes as a miniature). Strengths: Ability to withstand damage, a one-golem walking shield wall, can brace against enemy attacks, hellacious cleaving ability. Weaknesses: Lack of speed, no ranged ability. 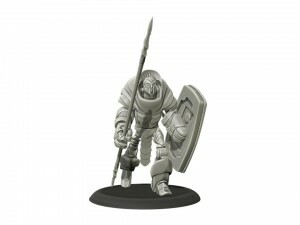 This golem is part of the core set of Torn Armor being kickstarted 3/3 to 4/4.